In patients undergoing reconstructive surgery of the face, treatment with botulinum toxin A (BTX-A, or ‘Botox’) can improve the final appearance of surgical scars, reports a clinical trial in the March issue of Plastic and Reconstructive Surgery®, the official medical journal of the American Society of Plastic Surgeons (ASPS). “This study demonstrates that early post-surgical botulinum toxin injections can produce better, narrower, and flatter facial surgical scars,” according to the study by XiaoXi Lin, MD, PhD, and colleagues of Shanghai Jiao Tong University School of Medicine. The results add to the growing list of clinical applications for BTX-A—beyond its cosmetic use in treating facial lines and wrinkles. The study included 16 patients undergoing facial plastic and reconstructive surgery at the authors’ department over a four-month period. The patients averaged 12 years of age. Most were undergoing surgery for some type of disfiguring facial birthmark, such as a melanocytic nevus or port wine stain. In each patient, half of the facial scar was randomly assigned to treatment with BTX-A or inactive saline (placebo) solution, injected immediately at the end of surgery. Six months later, independent plastic surgeons made measurements and rated the appearance of both sides of the scar. The scars averaged 6.74 centimeters in length, with a range of three to 16 centimeters (about one to six inches). The study included follow-up data in 14 patients. By several measures, the final appearance of the scar was significantly better on the half treated with BTX-A. On a 0- to 10-point scale (with 0 being worst and 10 being best), the surgeon’s ratings for overall scar appearance averaged 5.76 on the half treated with BTX-A versus 4.97 on the placebo-treated half. The BTX-A-treated sides were also lower and narrower than then comparison sides. Other scar characteristics (color, pliability, and vascularity) were not significantly different. Injection of BTX-A—best known by the brand name Botox—is widely used for treatment of facial lines and wrinkles. 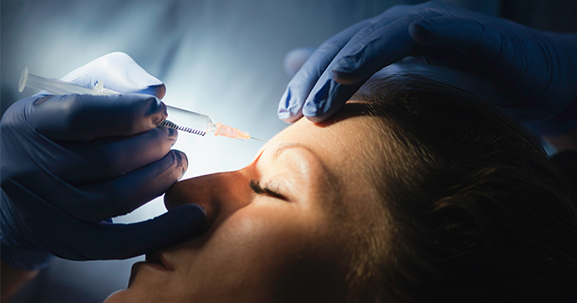 It is the most common cosmetic procedure in the United States, with about 7 million BTX-A injection procedures performed in 2016, according to ASPS statistics. In recent years, BTX-A has also been effectively used to treat a wide range of non-cosmetic problems as well. How does BTX-A affect the process of scar formation? “Temporary muscular paralysis induced by BTX-A could decrease movement and stress around a healing wound,” Dr. Lin and coauthors speculate. “This relief of tension may help prevent facial scar widening, hypertrophy and hyperpigmentation.” They cite previous studies suggesting that BTX-A might also inhibit certain cells (fibroblasts) and mediators involved in scar. The authors note some important limitations of their preliminary study, particularly the small number of patients included. They propose further studies comparing the effects of BTX-A on surgical scars with different injection techniques and in different locations on the face.